For ice crushing, blending, food processing and complete juicing. Total Crushing technology crushes ice and frozen fruit in seconds for creamy frozen drinks and smoothies. Use pitcher to create drinks, dips, sauces and more. Processor bowl evenly chop vegetables or make up to 2lbs of dough. BPA free. Dishwasher safe. 1500 Watts. 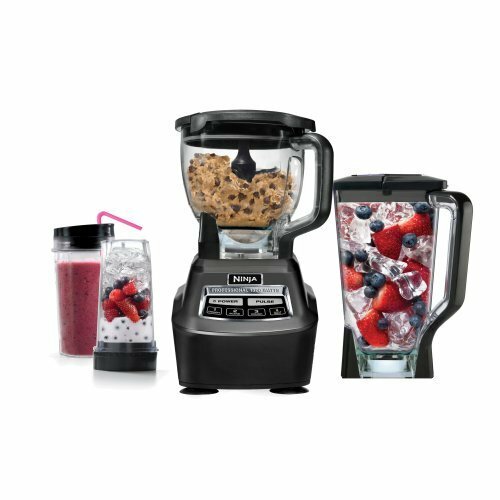 Equipped with XL 72 oz Total Crushing blender, 8 cup food processor bowl and two 16 Nutri Ninja cups.72 oz. Total crushing pitcher pulverizes ice to snow in seconds for creamy frozen drinks and smoothies.